Fri, May 1 and Saturday, May 2, Noon – 10 p.m.
How did this happen? Although I've been anticipating it for weeks, somehow the Cheers to Belgian Beers event has managed to sneak up on me. It begins tomorrow (!). Brian Butenschoen has posted a lot of nice information about the event at the Brewers Guild website, and I will now steal profligately from the best parts. In years one and two, it was two-sentence simple: participating breweries all used the same yeast strain to brew a beer of their own design, and fest-goers picked a winner. The winning brewery got to select the yeast strain and host the event the next year. This year, things got more complicated. Breweries are all still using the same yeast, but the Brewers Guild decided to try to create a little variety by compelling breweries to brew within one of four quadrants of very general strength/color divisions. (They held a dart toss to determine who got what.) Beers will be either lighter or darker than amber and stronger or lighter than 6%. From the Brewers Guild: "This year’s yeast will be Wyeast 3822 Ingelmunster Ale (formerly known as Wyeast 3822 Dutch Castle), which is a unique Belgian ale yeast that produces spicy/phenolic aromas, tart and dry on the palate with phenol and ester production balanced, for a complex beer." You would expect Doc Wort to provide a dissertation on the background of this yeast, and so he has. Briefly, it's the yeast used by the brewer of Kasteelbier. 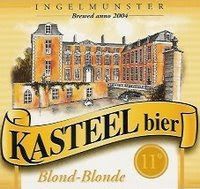 I would love to tell you more, but of the dozens of Belgians I have tried, Kasteel is not among them. We have the official list, and as your eye is drawn down the page, you will notice a few familiar names. Breweries are taking advantage of the event to release regular beers to their line-up, a wonderfully unexpected side-benefit of Cheers to Belgian Beers. Finally, I'll leave you with a little video I shot at last year's event. It gets a little draggy there in the middle, but I was enchanged by how the couple enjoyed and discussed their beer, so I left the whole thing in there. See you at the fest! Tonight I will be settling into a probably painful couple hours as our two big men, Joel and Greg, try to subdue a bigger man, Ming. So far, they've had no luck down in Texas. I am a moth and this is my fire--no matter how how painful the flames get, I must see the Blazers end--or maybe, just maybe--extend their playoff run. If you wish to avoid the pain or are--and this is slightly hard even to imagine, but such is the capacity of my brain--not a Blazer fan, there's a different big man appearing from 5-7 tonight at Belmont Station: Full Sail's John Harris. He is big in reputation and accomplishment, if not Blazer big: a stint at McMenamin's during its formative days, founding brewer at Deschutes (Mirror Pond, Black Butte, Bachelor Bitter--his) and now the master of the big beers at Full Sail. If you haven't met him, this is a decent chance. He'll have some Black Gold, as a fair lure for those not cracking a Session in front of the game. It has haunted me ever since. Of course, much of that language might have been lifted verbatim from my own descriptions. When I was writing up my notes from our grand weekend of imports, I felt my brain cramp up as I searched for adjectives. I waffled between the uselessly ultra-spare ("pale, white head, alcoholic, excellent") to the uselessly florid (but I didn't go so far as "split pea soup"). In the end, I felt like I should just offer hand signals, as if steering in a 747; ones that directed you toward or away from favored or despised beers. I now confront the specter of a Three Creeks review, knowing that I'm going to have to do better than what I managed to scribble at the time. ("Wheaty," really? Hey past self, thow me a bone here.) I want to take the blue pill and go back to when I thought I was doing a decent job with these damn descriptions. When I got my iPhone six months ago, an app leaped into my mind: an updated list of all the taps around town, so I could make my pub decisions based on what was pouring. (My "On Tap" list is a rudimentary effort to do the same thing.) Well, it's not an app, but the website Draft List is optimized for the iPhone and now has nine pubs listed. Go check it out. Once a year, I retire to a remote location with a group of friends to tell lies and behave badly. I abandon vegetarianism and drink more than I ought. This year's edition took place in Central Oregon (review of Three Creeks Brewing forthcoming), with the surprise attendance of a crop of lovely foreign beers brought secretly by a friend. A partial list, by memory: Hitachino Nest Red Rice and White, Grain D'orge Belzebuth, Steenberge Gulden Draak, (De Proef) Reinaert Flemish Wild Ale, Corsendonk Pale Abbey, St. Sebastian Dark, Castelain St. Amand, Huyge Delirium Tremens and Nocturnum, O'Hanlon's Thomas Hardy, and Samiclaus. What's really remarkable is that the friend who delivered this bounty isn't even a beer drinker: he picked them up at a beer store in California on the advice of the salesperson. Not bad. We didn't drink all of these, and some are old standards. Some, like the Corsendonk, is one of those famous beers I've never tried (for shame!). But there were also some discoveries, and I'd like to share three. Consider these strongly recommended. An authentic French Biere de Garde is a rare bird. Of the several companies making versions, I have been thrilled by few (Jenlain in particular leaves me cold). I find that most of the examples I've tried--including those brewed by US breweries--tend toward heavy sweetness. Castelain's is exquisite. Just 6% (the low end for style), it nevertheless tastes drier and more substantial, like a more fortified ale. It was a friend who identified the key element of the beer when he asked if it was a lager. Not exactly. It is an ale, but it's cold-aged. The result is a silky, dry beer with lovely warm undertones. Wonderfully drinkable. Although I've tried a number of beers from this brewery, I've somehow missed the White. A mistake. While some of their other experimental beers achieve a quality one might dub "interesting," White is flat-out tasty. 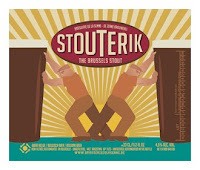 It takes as its inspiration Belgian wit (wheat, coriander, orange peel), but departs pretty sharply from the originals. The nose is almost exactly like lemon meringue pie. Like the nose, the beer is a balancing act between sour and sweet--though nothing like actual lemon meringue pie. It finishes crisply, with a lip-smacking flourish. To achieve this, the brewery adds orange juice and nutmeg. Wait for a hot day and track down a bottle. I regret to say that I didn't take notes on this beer, from De Proef. 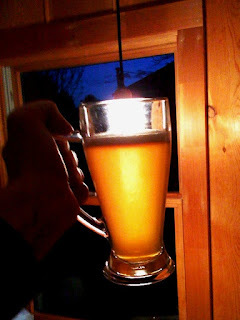 Brettanomyces can do a lot of things--make a beer funky, sour, or bone dry. In this case, it's the latter, which is what I mainly recall. Despite this, it was on the straightforward side of wild--not too funky or unapproachable. An inverse of the Castelain, it is light and suggestive of modest alcohol. Resist the urge to quaff it like a session, as I did. You'll come back to the bottle and discover it's 9%. In my case, too late. Ah, but my punishment wasn't too objectionable. Of course, there were other great beers in that batch, including world standards. You may not have tried all of these three, though, and I hope you will. Big fun. So I'm writing this on Thursday afternoon, a couple hours before leaving town for the weekend. It's probably a little too early to do a decent survey of your options, so I'll highlight Pelican Brewery's seasonals. Pelican was the only brewery to take me up on the offer to update me on their special beers. Other breweries, the invite's still open. Drop me a line! Nestucca ESB. Features English hops (Goldings, Fuggles), and was dry-hopped for a delightful fresh hop aroma. This beer just went on tap last weekend. 45 IBU, 6%. Riptide Red. Pelican's take on Irish ales, "Riptide Red is our local tribute to Irish heritage." 25 IBUs, 5.3%. Angler’s Amber. Based on the description, I'd say this is more like an alt than a NW amber ("Fermented cool with prolonged cold storage in the lager brewing tradition"). I love a good ESB, but this looks the most intriguing. But hey, if you're sitting in their gorgeous pub, there's no reason to restrict yourself to one. 50 IBU, 6.7%. Ah what the hell, here's a bonus recommendation, even though I don't know that it's current. (Just looks too good to pass up). As of Thursday afternoon, Concordia's website said they had on Double Mountain Terrible Two Anniversary ale. A bourbon-barrel aged brown. Mmmm, tasty. Upright Brewing ... Now Upright? If my Twitter feed didn't lie (and how could that happen? ), Upright Brewing now has beer out. Two nights ago--that was the day the Blazers beat Houston--a keg of strong ale went on at Belmont. I figured I'd catch a pint yesterday and have an early review up for you today. Ummm, no. It blew, apparently that first night. Anyone get to try it? Thoughts? Mr. Michaelson said recent weeks have provided the first good opportunity for insiders to buy since Redhook Ale Brewery Inc. and Widmer Brothers Brewing Co. announced the completion of their merger last July. Like many companies, Portland-based Craft Brewers restricts the timing of insider transactions.... With integration issues resolved, insiders were ready to buy, he said. Altogether, Mr. Michaelson and three other company insiders paid about $92,000 for 67,500 shares. Craft Brewers shares, under the trading symbol HOOK, traded Tuesday at $2.12, up 11 cents. Coming on the heels of positive poll numbers and an endorsement by the Oregon Liquor Control Commission, a proposal to raise the Oregon beer tax for the first time in 32 years is attracting more support. Such groups as Local 503 of the Service Employees International Union, Ecumenical Ministries of Oregon , the Oregon Prevention Education Recovery Association, and the Governor’s Council on Alcohol and Drug Abuse have thrown their support behind House Bill 2461. 61 percent of Oregonians favor increasing the beer and wine tax by fifteen cents a glass in order to ensure adequate funding for substance abuse treatment and prevention programs. This tax is supported in all regions of the state among Republicans, Democrats and Independents alike. Given a choice between cutting funding of substance abuse treatment and prevention programs or increasing taxes to ensure these programs are adequately funded, increasing the beer and wine tax is preferred by a margin of 64 percent to 29 percent. 80 percent of voters statewide are concerned about substance abuse, with voters outside the Portland Metro area most concerned. 64 percent expect substance abuse problems to increase as a result of the recession. Over the weekend, giddy from the sunshine, I picked up a three-pack of unsampled beers. Without further preamble or ado, I will dive into the reviews. I've actually had this beer before, but it's been years and years. I haven't seen the "Mad Brewers" in stores lately, and I've been hankering for one of their uncategorizable (but distinctively Belgian) offerings. I hadn't intended it to serve a s ritual beer, but as I was watching Bill Moyers interview David Simon on Friday, it occurred to me that it was a fantastic beer to drink as benediction to winter. That was our last drizzly, cold day before the warm weather returned. In Oerbier are the qualities that make winter tolerable; on that evening, the last time I'd need them. 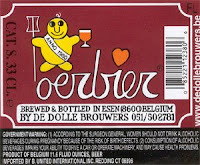 Oerbier is a strong, dark ale lightened and strengthened with candi sugar. This makes it appear denser than it turns out to be, though the violently effervescent, spring-fed head is a clue to its true nature. I was drinking it in dim light, but it appeared almost crimson (my colorblindness doesn't help where hues of red are concerned). The flavor is something like 3 parts Chimay, one part Flanders Red. The candi sugar means it's a little less creamy than a big abbey, but every bit as strong. In addition to the tart, cherry notes are spicy, wintry ones--cinnamon and cloves. A very nice beer and one regularly cited as a classic. I won't disagree: rating, B+. 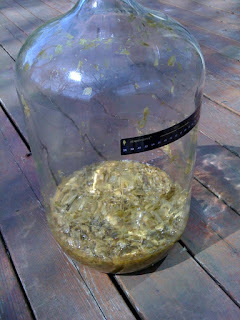 A friend of mine who is a gardner (but neither a beer drinker nor brewer) asked about hops today. She apparently is going to pick some up at Portland Nursery (I had no idea they sold brewing hops--mostly gardners don't care about the cones) and wondered which variety to buy. In that mania for list-making all men have, I have often mused on the five varieties I'd choose if I were stranded on a lush, hop-growing island. (With barley fields and an old abandoned barrel for roasting malt--hey, it's a thought experiment, work with me.) The list is predictable and pretty much maps to the major brewing regions, emphasis on NW (Cascades, Chinooks, Hallertauer, Kent Goldings, Saaz). But you know, then I think: thank god I don't have to limit myself to just five hop varieties. This is my one-thousandth post on Beervana. My first post was exactly 3 years and 3 months ago, on January 20, 2006. Gallons of freshwater consumed in the production of a gallon of milk and beer, respectively: 1000, 300. The water footprint is an indicator of water use that looks at both direct and indirect water use of a consumer or producer. The water footprint... is defined as the total volume of freshwater that is used to produce the goods and services.... Water use is measured in terms of water volumes consumed (evaporated) and/or polluted per unit of time. He doesn't explain exactly how he calculated the water use for beer, save for mentioning the ingredients, but the result is counterintuitive. Beer is generally described as a water-intensive product. Yet he lists a number of products (apples, bread, cheese, chicken, pork, tea, etc. ), and beer is quite low compared to most others, not just milk. For example, it takes about the same amount of water to produce a single apple as a glass of beer (70 liters vs. 75 liters). Other products have their footprints listed in other measures, so it's not so easy to compare (40 liters per slice of bread, 2400 liters per hamburger, 3,900 liters per kilo of chicken meat)--but these are obvious water hogs by comparison. This is a lesson in measuring total consumption versus final-stage consumption. Breweries consume a lot of water, but when you compare the water consumed by the ingredients used to make beer along with the brewery's use, beer's water footprint is quite low. So drink up--beer is a low-water-use product. In yesterday's "best bets" post, I totally forgot the really big show this weekend--the Blazers. I am a member of the unwashed masses who will be watching from outside the Rose Garden, but I'll be doing it in style--pre-functioning with friends around a pit of burning meat*, hand cradling a fine ale, bald head testing the intensity of the sun. I will confess to being stymied on the ale business though. For old-time Blazers fans, this is a moment we've anticipated (somewhat despairingly) for well over a decade. I know we were in the playoffs more recently, but that was the Jail Blazers--and no self-respecting fan found joy in the team. Now we have a crew of fine kids we're proud of, and we finally have a team we can root for in the playoffs. Beer selection for such an event is not to be handled blithely. I think I'm going to go with the beer that captured my fancy yesterday, though--a weisse. All right Blazers, make us proud! Update. Oy. Now I need a beer that makes me forget everything that happened in the previous 24 hours. *As a poor vegetarian, one who is seduced by a plump, barbecued bratwurst, today will be a test. The "on tap" list at the upper righ-hand corner of this blog is the area I most often visit. I like to know what's on tap before I head out to a pub. The places linked there have totally rotating selections and keep their taplists updated. Unfortunately, there are a lot of great places in town who don't post their updated taplists online. This is particularly true of brewpubs. Many have three or more seasonals on tap at any given time, and the only way to find out what they are is to visit the pub. I would love it if you'd let me know what's pouring so I can include you in my Friday "Weekend Best Bets" post. So consider this an active invitation/solicitation. Send along your current seasonals, and I'll consider them for the weekend post. This weekend will be sunny and, by current standards, hot. As such, I have scanned the taplists for sunshine beer. One of the best hot weather beers is Weihenstephaner Hefe Weissbier, pouring at Concordia Ale House. A good German Weiss is a damned hard beer to top on a sunny day. Belgium's answer to Weissebier is witbier, and Hoegaarden's is pouring at Belmont Station. Another fine choice in this vein is the rare-ish Hair of the Dog Greg, a light squash beer. You can find it at the Green Dragon. Also available, Oakshire's version of the wit style. If none of these please you, click around my "On Tap" links and find something that does float your boat. No one has ever tried to map the exact boundaries of Beervana. Just Portland? Oregon? What about Southern Washington--do we claim Walking Man, too? Personally, I think it's a state of mind tethered somewhat loosely to geography. 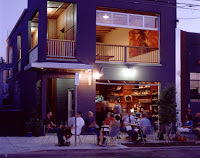 Walking into the Elysian brewpub a few years back, I was stunned by how mcuh it felt like a place somewhere in East Portland. It was socio- and beeriologically indistinguishable from brewpubs in the Rose City. It is perhaps beyond convention to include Seattle (Beervana is the proud marker of a somewhat tetchy local population, after all), but in terms of continuum, you can't really draw a line that separates the beer culture of Washington and Oregon. This apparently random rumination springs from comments Indianapolis-based Generik420 makes on my "beer regions" post below. He rightly points out that state lines are a crude measure. In the Midwest, Chicago and Indianapolis are culturally part of the Upper Midwest; the lower half of these states drift culturally toward Dixie. The Indianapolis metro area comprises almost 1/3 of the population of the state and is located almost dead center in the middle, and is close to the density you used for the Beer Midwest states. Of interest to me is the fact that of the 28 breweries in Indiana, 20 of them are in the northern half. I also happen to know that there are 2 new breweries set to open within the next few months in the northern half. I don't have true figures for this, but I feel fairly comfortable saying that most of the Illinois brewing capacity is occuring around the Chicagoland area which again is the northern area of Illinois. I totally agree. This is exactly why I was trying to map regions--state lines are a crude measure and fail to capture cultural, beeriological (I may have coined a term here) geography. The upper midwest is definitely steeped in beer culture, but the definition of that region cuts through some states and loops together several. But it got me thinking. Portland is regularly cited as the best beer city in the country. There are other contenders, but you understand the point. It is in any case the most-breweried. Yet Portland's share of Oregon breweries is modest. As Generik points out, 71% of Indiana's breweries are in Indianapolis. Only 40% of Oregon's breweries are in Portland (38 of 96). This is a rather remarkable fact: the most breweried-city in the country has a minority of the breweries in its own state. You drive to most any Oregon town of 10,000 people or more, and you'll find a brewery. This is a marker of the penetration of beer culture into mass culture in the Northwest (the Washington Brewers Guild doesn't keep the same handy stats, but Seattle's share of WA breweries is probably roughly similar to Oregon's). Craft brewing is not an urban phenomenon--it's a regional one. We have passed a tipping point and now good beer is just part of the cultural tapestry. Numbers don't tell you the whole picture, but sometimes they can point you to in the right direction. Photo of Pelican Brewery courtesy of Travel Oregon. I have a nearly overwhelming desire to create single posts out of each of these bits of news to drive up traffic. I'll try to rise above the base desire and give you an omnibus post. Here we go. I received word from Jules Bailey's office yesterday that his Honest Pint act (HB 3122) is "scheduled for a work session next Wednesday in Business and Labor." Okaaaay. (Even a wonk like me didn't know what that meant.) On reply, I learned a little bit about our legislative process. A "work session" is the moment when the committee--in this case Business and Labor--decides whether to send the bill to the main floor of the House. Baby steps, but it would keep the bill moving along. (Once it gets to the floor, the House decides what to do with it; if they pass it, it goes to the Senate and then the Governor.) Send out your good vibrations. Fred Fest, which I have never attended, is purported to grant attendees temporary nirvana ... and that's just the unworthy ones. For worthies -- well, some are never heard from again. True story. Tickets are fifty bucks, which, when you consider the payoff, ain't much. Even a cheapskate like me might find it in his tightwad heart to muster the lucre. There's an attractive new website, at which you can buy one of only 250 golden tickets, no doubt going like hotcakes. What would Fred drink? Word. When I was in Belmont Station recently, I saw that on April 30, John Harris will be doing a meet-the-brewer. John is man you don't want to exit this earth never having met. If you are in that unsavory circumstance, remedy it pronto. Like on April 30. Go watch now. You won't be disappointed--promise. 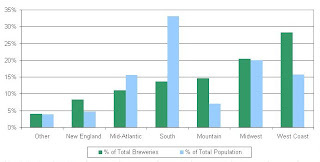 In the post below, where I reprinted the data from the Brewers Association about breweries per capita, I promised to show you some more interesting regional data. Here we go. For the purposes of this breakdown, "other" refers to states on borders between regions--Nebraska, Kansas, Oklahoma, the Dakotas, as well as Hawaii and DC. You could through Hawaii (9 breweries) in with the West Coast and it barely changes things. But we shouldn't be forced to break the country down into regions so slavishly. If you go through and select out the states within regions that are especially dense, you can pinpoint heavily-breweried regions even more precisely (see lists in footnotes below and blame Lew Bryson if you don't like the looks of Central Atlantic). Now the rejiggered regions. Look particularly at the regions in comparison to the national average. I didn't do these calculations only because doing calculations like this please me immensely--that was just a fringe benefit. The whole point of this is to see if my pet theory about the US having discrete brewing regions holds water. My theory holds that within these five sub-regions people drink local beer, but different types of local beers and in different ways. The markers of these regions is not the breweries per capita (see Minnesota in notes below); rather, the breweries per capita is just one rough guide to where the regions are. Anyway, I thought you might appreciate some data showing a more fine-grained look at the per-capita numbers than the Brewers Association provide. The beer regions look like this. Northwest: Alaska, Oregon, Washington. Mountain: Colorado, Idaho, Montana, Utah, Nevada, Wyoming, New Mexico. New England: Connecticut, Maine, Massachusetts, New Hampshire, Rhode Island, Vermont. Beer Midwest: Wisconsin, Michigan, Iowa. Central Atlantic: DC, Delaware, New York, Pennsylvania. The whole-country samples follow established regional definitions, except for "other," which is comprised of Nebraska, Kansas, Oklahoma, the Dakotas, Hawaii, and DC. Including Hawaii in the Northwest section barely changes the figures. What about Minnesota? This was a head-scratcher. For some reason, Minnesota doesn't have the brewing density of Upper Midwestern kin Wisconsin and Michigan. Their ratio of 1 in 236k is slightly lower than Missouri, and way below others in the "Beer Midwest" region. Truth is, I think Minnesota is culturally part of that continuum, but I'd like to visit and confirm this suspicion. It is one of the biggest riddles of the data. The Brewers Association has released another document on breweries per capita, which I will include below. I've posted similar stats before. As you glance through the list, look at the per capita numbers, which start to hockey-stick at number 40. 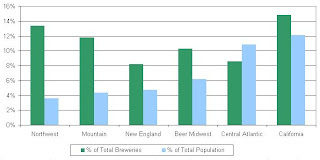 Breweries are nearly twenty times as dense in Vermont (1) as Kentucky (45). They're nine times more dense in Oregon (3) than New York (39). As you can see, states with small populations over-perform. California, with the most breweries of any state (by far), is a middling 21. Oregon does admirably, placing third behind Vermont and Montana. Washington is 8th and Idaho is 12th. I was recently looking into per-capita numbers by region, and this is actually pretty interesting stuff. If you look at the bottom dozen or so, you see all of Dixie. Breaking down the per-capita breweries by state is sort of interesting, but understanding it by region is far more interesting. I'll post that later today. This just came across the transom. Looks cool and it's for a good cause. Happy tax day! We just wanted to remind everyone to join us for our Tax Day Beer Gardening Project and the Laurelwood double IPA "Green Mammoth" release party - hosted by the American Center for Sustainability. 100% of all Laurelwood pint purchases will be dontated to the the ACS. I got an email about a strange new mag called Drink Me. Normally I round file these--especially products like this only tangentially about beer--but when I flipped through the online copy, I was amused to see the one beer article was about Pabst. Of course, I thought instantly of the snit this would provoke in Doc Wort, so I had to mention it. Brewery owners are now charged with the task of all competing for your one mouth, whether you drink a single bottle of beer with dinner, three cups at a ballgame, or go for the lost weekend down by the river. As such, most brewers run their companies similarly for economic reasons. And because first and foremost they are businessmen and women, trying to get them to talk about non-industry issues was a challenge. Being operations-minded, they often talked about issues of distribution, of cleaning stainless steel, and of bottling, which really isn’t so fascinating. But when they get to the point where their job and their numbers transcended mere productivity, I find their stories and lessons captivating. It's part one of a series, and I confess I'm mighty interested in reading part two. 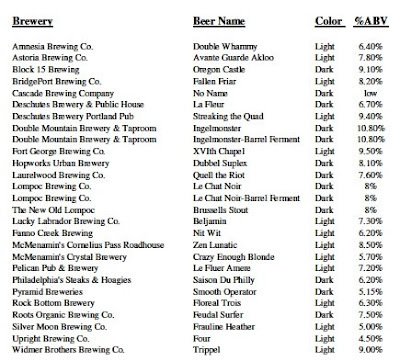 The annual Brewers Association list of top breweries is out. As always, it contains no numbers, rendering it it nearly, but not totally, useless. Numbers matter quite a bit. They point out that the distance between one and five is greater than the distance between six and fifty (or whatever--without the numbers, we don't know). They also tell us whether breweries are growing, standing pat, or shrinking, never mind what their relative position is. (Rogue, which fell two spots, may have increased barrelage, which is certainly more important to the brewery than whether they were passed by Gordon Biersch in the rankings.) Aside from whipping up some brief news, in fact, relative positions don't tell us a whole hell of a lot. That said, since we don't have those numbers and do have this list, I guess we go with the list. Changes from last year's list include breweries moving up or down in the rankings based on volume sales. There was one new entrant into the Top 50 Craft list, The Saint Louis Brewery, and two craft brewers have claimed spots in the Top 50 Overall list—Big Sky Brewing Co. and Mac & Jack's Brewery. Consolidation of MillerCoors, last year's number 2 and 3 brewers, opened up a slot, and the merger of Widmer Brothers and Redhook into the company now named Craft Brewers Alliance, Inc. opened up another slot filled by emerging small and independent craft brewers. This raises a thorny issue for the Brewers Association. Long an advocacy group created "promote and protect small and independent American brewers, their craft beers and the community of brewing enthusiasts." That was all well and good when they could neatly tuck craft breweries into a tidy box: "An American craft brewer is small, independent, and traditional." Craft breweries and macros were qualitatively and quantitatively different categories even a decade ago. Now the categories are less tidy. As a market matures, you inevitably see consolidation, buy-outs, and now even the macros are making beer indistinguishable from micros (albeit not the best micros). Breweries like Boston Beer Company, by virtue of their success at selling great beer, will one day exceed 2 million barrels. What then? BridgePort, on the list for craft breweries, is owned by Gambrinus, a Corona importer that owns five breweries. Mendocino, a founding craft brewery that still produces the same beer it always has, is owned by UB Group, and international conglomerate of breweries--and is not. The Pyramid/MacTarnahans company is, the Redhook/Widmer company is not. I'm certain this accords with the ever-more-byzantine rules that guide membership in the Brewers Association, but those definitions are increasingly arbitrary. It's only going to get worse. Eventually, the Brewers Association is going to have to make some hard choices, limiting the pool of brewers to those that fit a neat, clear definition. It's hard to imagine that any guild could both represent Hair of the Dog (annual capacity: +/- 1000 barrels) and Boston Beer (over a million barrels). If they don't, a competing guild will naturally arise to serve the very different needs of these segments of the market. I have been too busy to put together anything resembling a real post today, and I am disappointed to find no content about the Spring Beer Fest among the local blogs. (To, um, you know, steal from.) The silence deafens. I've finally posted an Honest Pint Project page on Facebook. If you're a member of Facebook, visit the page and become a fan. The utility of Facebook is still not perfectly clear to me, but it's a good fit for the project--after all, I mainly want to spread awareness. Update, 3:26 pm. We just hit 100 fans--whoo hoo! Also, and I think this speaks to the strong position of craft brewing, about a third of the fans are women. The response rate hasn't been so hot for my poll about your drinking habits. I'd like to get 250 responses, and we're currently only at a bit over 100. If you haven't answered, please consider it. Also, a reminder that if your habits have changed in more than one way due to the recession, just select the way you're dealing with the squeeze most often. Beer Drinking Habits, April 2009. As a result of the recession, how are your beer drinking habits changing? Ah, what joy. Go Blazers! Allagash Tripel Reserve (Concordia Ale House). Allagash does Belgian ales, and they take pains to make a great tripel. This version is drier than most you will have tried, but smooth, gentle, and yummy (technical term). Beer Valley Leafer Madness, on cask at Belmont Station. Dunno if it's any good, but an imperial IPA (9%, 100+ IBUs) from Ontario, Oregon on cask--three facts that tip the scales in favor of sampling. Bike Town Brown, the latest Collaborator is on tap at the Eastburn. I went to a Brew Crew meeting last night to do some research and was reminded that Collaborator is one of the rare jewels in the crown of Beervana. Browns are perfect beers on a 52-degree, rainy day. Guess what the weekend's weather is supposed to be? Cascade Mouton Rouge (Bailey's). The most under-rated of the Gansberg sour lineup, this is the base beer for many others, and it's wonderful on its own. The Horse Brass has one of my faves, Caldera Dry Hop Orange, and there's a beer there I know some of you don't hate--Pliny the Elder. Finally, a couple good ones are pouring at the Green Dragon: Fort George Raspberry Wit, a beer I really enjoyed when I was in Astoria (check out the subtlety of the rasberries and how the wit character remains). And although I have not tried it, Lost Coast Double Chocolate Porter beguiles. Double chocolate? What can it mean? A Glitch or the High-Water Mark? [O]ne wonders how long the "big" little breweries can make it without succumbing to the beast of advancing brand development. And, with that, what will happen to the local products. This is an interesting moment. When I first started writing about beer in late 1997, it was a similar moment--craft brewing had been growing by double digits for a decade, and a number of breweries had made the jump from micro to substantial. In Oregon, Widmer, Full Sail, and Portland Brewing had all invested in much larger facilities. In fact, up and down the food chain, breweries were making decisions on the assumption of future growth. Compare that to the last few years: double-digit growth, lots of new entrants into the market, and a general sense that the ceiling for craft beer was quite a bit higher. Breweries haven't been investing in huge new facilities, but they have been growing. Both Widmer and MacTarnahan's/Pyramid have grown through mergers. Full Sail continues to do robust contract work. Can we expect a shake-out like the late 90s produced? Probably. But things are quite a bit different now, and here's where I disagree with MR. A decade ago, some breweries did follow the trajectory he describes. In order to appeal to mass markets, they produced safer, blander beer. Other breweries, however, went the other direction. They doubled down on distinctive, rich beers. Over the following years, the shakeout hit the former breweries far harder. MacTarnahan's is a case in point. For a period during that time, Alan Kornhauser was off leading Pabst in China and the brewery turned to Brett Porter. Portland Brewing (as it was then known) had made its bones on MacTarnahan's, a decent amber ale that was increasingly getting lost in the shuffle. Their other beers were safe and clean, but no one's favorites. Brett produced a series of very distinctive beers and for a while, I thought the brewery was doubling down. Alan returned, though, and Brett's beers were forgotten. The brewery followed Kornhauser's instinct to pursue a strategy that worked for the macros he'd made a career brewing--lowest-common denominator stuff. They thought they could corner the amber market. Obviously, the whole thing was ill-advised and the brewery is now going through that death-spiral of absorption into increasingly larger amalgams of indistinct brands. I do think there's room for growth in the market. Nationally, just 5% of sales are micro. I have a hunch that all across the northern half of the country there are future drinkers who haven't yet had their first transformative experience with a Sierra Nevada Pale. That number could easily double, providing a huge opportunity for larger craft breweries. The ones that seize the market will be those with distinctive, characterful beer. Shakeouts actually serve a healthy purpose--they weed out the underperforming players. As warmly as I feel toward Portland Brewing, it's proud history, and founders Art Larrance and Fred Bowman, I can't think of an argument to be made for their survival. If Pyramid/MacTarnahan's vanished off the face of the earth, would anyone notice? The next couple-three years may be tough for middle-sized and larger craft breweries. But it's probably good for the overall health of the market. Darwinian and poignant, but good. About time. I hope Washington gets on board with this. All over Europe it's mandatory to fill to the "line". If a bartender doesn't, then you go ask for a new pour. It's pretty ridiculous that there's no standard here. I don't even drink any more and I'm in favor of this idea. If a business claims that it's main product contains 16 ounces then it better bloody well contain 16 ounces. Why didn't the Washington legislature think of this first? How long will it take for us to catch up with our Oregonian brethren on this key issue? My mom, who has a friend in Colorado, phoned to pass on word that the Denver Post also has a story today on the Honest Pint Act. They give me a mite too much credit, though, failing to mention that it was, in fact, Jules who champions it. What I find amusing is the rather dismissive reaction they get from locals. Chris Black, who oversees Falling Rock Tap House in LoDo, is less frothed up than Alworth over the issue. "If you call it 'a glass' it doesn't matter. In the U.S., how we measure glassware is different than elsewhere — say, in Germany or England." Charlie Papazian, one of the industry's leading advocates and president of the Boulder-based Brewers Association, has heard it all before. "That issue and that notion about full pints has been around for years." You'd expect more from the Napa of Beer, wouldn't you? Finally, Draft Magazine noted the story, as well. Back in January, I ran a poll asking you to describe how your beer-drinking habits had changed. At that point, there was not much evidence of a trend away from craft beer. This week we learned that craft beer sales are down even while macro sales are apparently up--so it seems like a good time to run the poll again. I am keeping all the answer categories the same so we can compare them. I should have added a catch-all category ("I'm using a mixture of techniques to save money"), but since I didn't, I won't do it here, either. So, if you are using a variety of strategies to keep costs down, just check the answer you rely on most often. After a couple days, I'll post the results, along with those from January. In my post below about how the recession is affecting local brewers, I offered the hopeful--and wrong, it turns out--news that craft breweries saw sales rise in '09. I spoke to the Oregon Brewers Guild's Brian Butenschoen and got the lowdown: craft beer sales are down 5% and 7% in January and February. The bit that confused me was that beer sales are up 10% and 20% in those same months. I asked Brian to explain, and he gave some more texture. He thinks sales of imports are down, as are national micros like Sam Adams and Sierra Nevada. He thinks the only windfall is in the "value segment" (PBR and the like). A big factor in Oregon's situation may be pub and restaurant sales, which account for just about half the beer sales. He wonders if the shift is coming as people forgo the $5 pint and buy an eight-dollar sixer instead. It's hard to know how bad things will get, but summer sales should be illustrative. If sales remain poor, it could mean we're in for a long down period. If they show signs of rebounding, that will be good news for breweries who make the bulk of their money during the sunny months. In other news, I see that Hopworks is releasing a beer called "Terry Porter" (6.0%, 14.2 P, 45 IBUs) in honor of our greatest point guard (and my favorite Blazer). This is slightly related to homebrewing, for I too have whipped up a batch of Terry Porter. But can Hopworks top this? A couple years ago, when Oregon was making its run through the NCAA Tourney, I dubbed a beer Tajaun Porter. Less than six months after Woodinville, Wash.-based Redhook Ale Brewery Inc.’s merger with Portland’s Widmer Brothers Brewing Co., the new company has written down the value of the Widmer brand by more than a third. Last week, the company that resulted from the merger, Portland-based Craft Brewers Alliance, released its 2008 annual report. For the year, the company lost $33.3 million on $86 million in revenue. The loss included a $30.6 million impairment for Widmer assets acquired in the merger. Of the $30.6 million, $6.5 million is a write-down of the value of the Widmer brand, which the company valued at $16.3 million when the merger closed July 1. The swiftness with which Craft Brewers restated the value of Widmer surprised analysts. December and January shipments for all Oregon craft brewers fell by 5 percent and 7 percent, respectively. But in January and February, shipments for all beer in Oregon actually rose by 10 and 20 percent, respectively. “It would appear trading down from higher-priced, locally-made beer has already begun in earnest,” said Brian Butenschoen, executive director of the Oregon Brewers Guild. I guess it's not surprising that a recession would produce winners and losers. Let's just hope there are no real "losers" and that everyone makes it through in the end. I have been tardy about getting back to the breweries on my recent trip to Astoria. Let us now correct this oversight with a consideration of Fort George Brewery. Hours: Mon-Thurs, 11am -11pm, Sat 11am - Midnight, Sunday, Noon - 11pm. Live music every Sunday night 8-10pm. Prices: Glass - $2.60, Pint - $3.85, Pitcher - $13, Taster tray - $8, Growler - $14. Beers: A large range of NW-style ales, Belgian interpretations, and regular use of botanicals. As a region, the Oregon Coast, from Newport north, is starting to look like a mini-Beervana within Beervana. The two pillars are Rogue and Pelican, but Bill's Tavern, Siletz, and Astoria Brewing have all garnered plenty of praise. Since Rogue has a northern outpost in Astoria (and the nicest of all their pubs), you could spend a couple nights on the coast and hit a half dozen stellar breweries, all within a wonderful drive down highway 101. Fort George is a great addition to this slate, and one born from it. The brewer who took us on a tour, Chris Nemlowill, is a co-founder and co-brewer along with his partner Jack Harris, the man behind Bill's Tavern in Cannon Beach. Chris is also a local. He got his start at Bill's where, fresh from college, with degrees in computer science and marketing, he offered himself an internship. He showed up and told Jack, "I want to do an internship and work for you for 120 hours--for free." Bill took him up on the offer, and he learned how to brew commercial volumes (it almost doesn't bear mentioning that he started as a homebrewer--but of course, he did). In '05 he got a job at Astoria/Wet Dog, and in 2006, he and Jack opened their brewery in the historic Fort George Building in downtown Astoria. Chris bought us a taster tray of Fort George's handmade sausage, four varieties, and they were all exceptional. (I have a friend who loves sausage and he always asks why I don't write more about it. Brian: this is the good stuff.) Chris also plopped a nice plate of rough-cut fries with skins, and those were also excellent. But beyond this, I can speak to none of the food. The website has a menu, and it features mostly pub-style food, with a nod toward local seafood. Astoria's a great place to visit, and if you do, be sure not to miss Fort George. If you exit the town without trying at least a pint of the Vortex, you'll never forgive yourself. Serendipity sent me by the future Hobo Brewing yesterday as Kiley Hoyt and Elan Walsky were puttering around out front. I was attracted by the three jugs of yeast visible through the open door (you can see them in the picture below). Sure enough: yeast. Kiley and Elan are recent graduates of Siebel, and they met at Steinbart's before deciding to open shop together. Hobo will be a microbrewery in the old sense--3.5 to five barrels. For the moment, Hobo only occupies the bottom floor, but they hope to be able to expand to the second floor in the future. I think I caught them pretty early in the process; they seem to be in full R&D mode, just exploring the types of beer they'll brew. I had a follow-up question about the name, and Kiley said in her email this morning that they were up until midnight brewing. Call it the elbow grease stage. "It was just something that made sense. The company was born only last year and hearing and seeing all the struggling going on due to the tough economic times (I myself was laid off), we chose the name Hobo. A hobo continues through life relying solely on the the support of others--friends, family, and strangers alike...We want to have a place where people can stop by during their travels, feel at home, enjoy their stay, and not break the bank." This is perfectly consonant with the neighborhood, which has long been the center of Portland's communal vibe. You can probably catch Kiley and Elan at the brewery--especially on sunny days when the door will be open--and welcome them to the neighborhood. They are personable and welcoming, and seemed genuinely thankful for the interest people expressed. I'll keep you updated as they progress toward opening. Right now they're shooting for summer. I will say this: regardless of what becomes of the Honest Pint Act in the legislature, one thing is certain: the issue is getting attention. When I first launched the Honest Pint Project, that was the main intention. As long as consumers recognize what's happening with glassware, they are informed enough to begin to make judgments. By that measure, this has been a roaring success--way beyond what I could have imagined. The latest comes via KATU, with a very nice report on Jules Bailey's bill. I can't help but feel a warm sense of accomplishment. If my traffic is any guide, ain't no one sitting around reading blogs today. Good--this is a day to be outside, not reading blogs. (Current temperature: 71 degrees.) 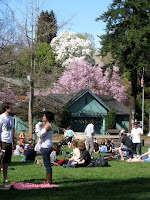 I was out myself, taking a walk down to Laurelhurst Park where the trees are putting on an early display. On the way home, we happened by a building with an intriguing sight inside: three small jugs with air locks, looking suspiciously like brewers yeast. Two folks were puttering around inside the door (open, garage-door style, to the gentle elements) so we were able to learn that indeed, it was yeast. By a stroke of luck, we had stumbled onto the birth of a brewery. Given that this is a scoop of sorts, I'm going to milk the news and tell you about it all tomorrow--I so rarely break news. But I can share with you my joy--the future brewery will be just four blocks from my house. Four blocks! Springtime, when breweries blossom in Beervana. The Eugene Register-Guard reported the story, too. David Steves and Andrea Damewood write quite a nice piece and get my position spot-on. (It's interesting--Steves is one of my favorite reporters for the R-G, Har for the O. Nice.) If you have a chance, click through and read this article--it's pretty in-depth. They did some backstory reporting on local pubs, talking about the impact on local business. One quickie response: it's true that to be certified as a purveyor of an honest pint under the legislation you'd need to buy new glassware (if you weren't previously serving honest pints), there's a simple, free fix: don't call them pints. Nothing wrong will selling "glasses" of beer. In his latest brewsletter, Rick Allen reports a malfunction with his glycol chiller has left him with six weeks of lost beer. He now anticipates the next bottling on May 17. So if you hanker for a local lager, you best stock up quick. There are now a whole lot of people across the country who know about Hopworks. That's gotta be good for business, right?